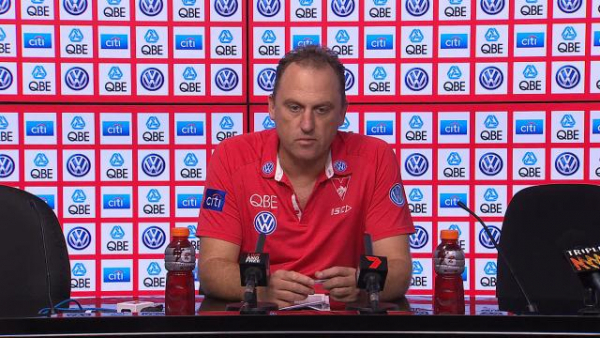 The Swans have dismissed any suggestion they’d consider trading Lance Franklin as the superstar forward’s wife appeared to make her thoughts clear on the matter. Lance Franklin on Saturday night further strengthened his legacy as one of the game’s all-time greats — and showed why the Swans can’t afford to trade him away. Lance Franklin’s standing in the game has strengthened again, with the superstar forward moving one spot up the all-time VFL/AFL goalkicking table. As a kid Brandon Jack’s Saturday would often start with a thud, his older brother Kieren tearing into the living room to smack him down with a chokeslam to the tune of ‘The Undertaker’s’ theme song - and Brandon believes his raring competitive streak is what's set him up for 250 games. Sydney Swans young gun James Rowbottom paints a picture of the roundabout way in which coach John Longmire broke the news of his AFL debut. The Sydney Swans clash against Richmond at Marvel Stadium on Saturday night will be broadcast LIVE on Channel Seven’s primary channel into Sydney. In Round 19, 2009, Michael O'Loughlin became the first Sydney Swans player in history to reach 300 games. You’ll struggle to find a more animated Sydney Swans supporter in the stands than long-time member Tom Jellett. Not in his wildest dreams did Kieren Jack believe he would reach 250 AFL games when he was drafted as a rookie by the Sydney Swans. Lance Franklin was a name synonymous with Hawthorn before it became synonymous with Sydney. Fleet-footed young gun Oliver Florent credits his glowing early-season form to a relentless approach to his game – and he’s intent on again coming to the fore in Saturday night’s showdown with Richmond.